This time of year, no one wants to hear the word snow unless it’s referring to a beautiful early flowering perennial flower like snowflake candytuft (Iberis sempervirens). It is appropriately named because its tiny, pure white flowers are reminiscent of snowflakes, and it flowers so densely that it looks like a blanket of snow. Snowflake candytuft is a beautiful evergreen, low-growing perennial flower. It grows only 8 to 10 inches tall, and each plant can spread about 18 inches. It can be planted in the perennial border, but can also be used as a groundcover. Its low habit makes it perfect for climbing around rocks or over short walls. Candytuft is easy to grow and can also be used in early spring containers with bulbs and pansies. Its foliage provides an interesting contrast in container combinations. It prefers to grow in full SUN, but does well with just a little shade. Plant in an area with average, but well-drained soil. It is quite drought-tolerant once established. The flowers can be 2 to 3 inches across, and it can flower for up to 10 weeks in the spring. Shearing it back after flowering will enhance the look of its dark, grassy-green foliage for the summer and maintain its compact form. 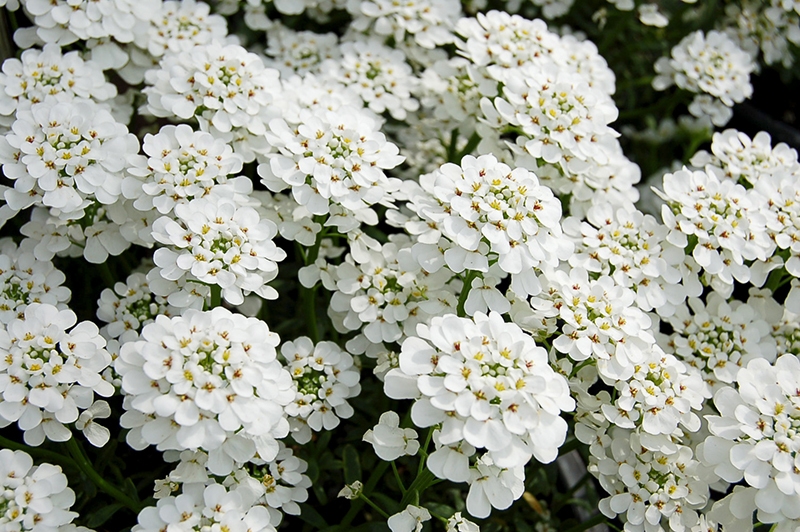 The habit and compact size of snowflake candytuft makes it an excellent choice for contemporary or Asian-inspired garden spaces, but it looks great in all types of gardens. While it blooms only in the spring, its foliage brings a simple and subtle beauty to the garden year-round.